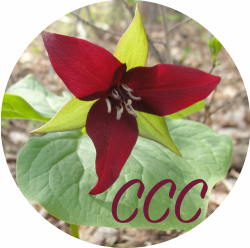 The trillium is a perennial wildflower of North America and Asia with 49 known species. The flower has three green or reddish sepals and usually three petals in shades of red, purple, pink, white, yellow, or green. Found in woodland areas, this early spring flower if left alone can flourish, but if disturbed it may quickly die. Some species are considered threatened or endangered, and collecting them is considered illegal. The image has been provided by photographer, Philip D. Collins. Curious, Collaborative Creativity Logo, 2016 by Caron L. Collins is licensed under a Creative Commons Attribution-NonCommercial-NoDerivatives 4.0 International License.